A Ukrainian soldier playfully tosses a grenade during a visit to old 93rd Brigade positions. Pisky was once a popular summer retreat, the shores of its river lined with palatial mansions and summer houses. Pisky was once a summer getaway hotspot. It was the place rich families would holiday during the warmer months, living in palatial estates complete with swimming pools and diving boards. I watch stray dogs run throughout town scrounging food, the sound of guns chattering in the distance breaks the eerie silence over Pisky. The cold air bites at my skin, a sign of the winter creeping across Ukraine. I catch falling snow in my hands while I walk. “Once you see Pisky, you don’t need to see Chernobyl,” a Ukrainian soldier says to me. After months of non-stop fighting and conflict, Pisky is now destroyed. Pisky lies extremely close to the Donetsk Airport, the scene for battles that would end in the deaths of hundreds of soldiers from both sides of the war. Buildings in Pisky have been converted into military positions, fortified fighting positions in windows are a common sight. Basements became bunkers, a hopeful safe haven during devastating artillery barrages. I am told that the Ukrainian forces in Pisky rarely saw the enemy they were fighting against. Instead, it was long-range warfare: tank strikes, artillery barrages, and snipers. Pisky was a town where life and death came down to being in the wrong place, at the wrong time. One reading room I stepped into was hit by a tank shell. Nearby, books have been pierced by a bullet from a sniper rifle a kilometre away. There was no escape from the constant danger and death. We walk into an old school, wind howling through long hallways. Chairs are still up on tables, books left open, waiting for a class that will never come. Notebooks and equipment are strewn about, happy education slogans and bursts of colour a glaring contrast to the background of destruction. Ukrainian soldiers erected a makeshift cross in the school’s courtyard, a memorial to friends and comrades lost in the fighting. Our last stop is a church on the edge of the town. The outside of the church has been destroyed by damage from artillery. It’s one of the most visible structures from Separatist positions. Inside, clothes are strung up to dry, and a makeshift shrine sits in the corner. We take a moment to reflect. Over 3,000 people called Pisky home, and a handful remain. The U.N. estimates that more than 1,400,000 civilians have been uprooted by the terror of the War in Eastern Ukraine, with over 2,500 having been killed. Despite the death and devastation, some residents stay behind in Pisky with nowhere else to go. The main road into Pisky, a village that held significant geographical advantage to Ukrainian strategies throughout the entirety of the battle for Donetsk Oblast. Military vehicles ferry supplies in and out along this road, as well as provide emergency medical support for soldiers wounded in conflict. Since beginning nearly two years ago, The War in Eastern Ukraine has claimed the lives of over 8,000 military personnel and civilians. Unexploded ordnance, like these mortar rounds and BMP ammunition, lie all over Pisky. The War in Eastern Ukraine saw heavy shelling with mortars, self-propelled artillery, and Russian-supplied GRAD rockets. Many Ukrainian towns and villages now lay in ruins as a result of the bombardments. Pisky’s two sides are divided by a river, this bridge serving as one of the few reliable ways across. Easy to miss, this mortar round struck the ground and didn’t detonate. There are still landmines and unexploded mortars littered throughout Pisky, proving a dangerous and difficult project for Ukrainian sappers tasked with disarming and destroying munitions. The exterior of Pisky’s hospital, riddled with holes from small-arms fire, rockets, and shrapnel. A piano toppled during fighting in Pisky’s Cultural Centre. A cross made by Ukrainian soldiers in memorial to people who lost their lives fighting in and around Pisky during The War in Eastern Ukraine. 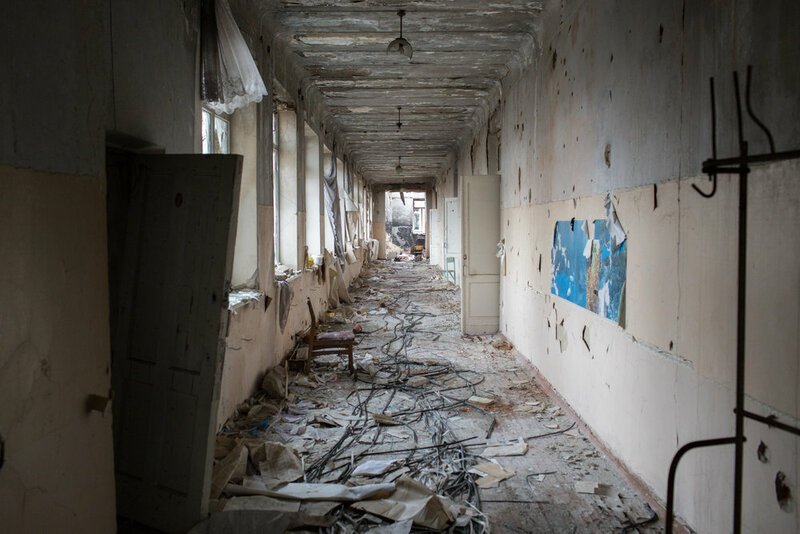 An abandoned classroom in Pisky’s school. The yellow tube contains a chemically preserved fish. A mural on a wall in a classroom in Pisky’s school. Stools and chairs still remain on tables following the the displacement of Pisky’s civilian residents. Looking back-to-front in the previous picture. Old science equipment inside of a storage cupboard in Pisky’s school. More damage after a Russian-supplied Separatist tank attack.